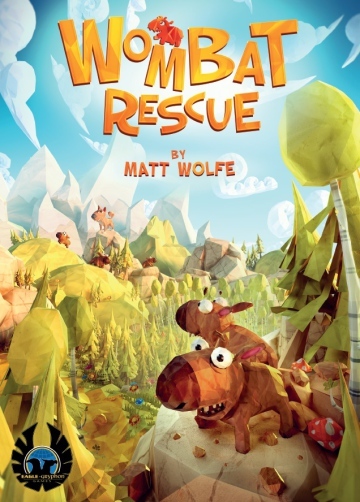 This time my friend Matt Wolfe joins me to talk about his first published game, Wombat Rescue. Matt is an awesome and fun guy and I hope you enjoy our talk. Tom: Well, Matt, you’re living the dream with signing your first game, Wombat Rescue with Eagle-Gryphon Games. How does that feel? Tom: First talk about the game. Matt: So first I have to talk a bit about wombats. Wombats poop cubes, which is absolutely a true fact. Scientists theorize that, due to extremely poor vision but an excellent sense of smell, wombats use their poop cubes as “smell markers” to help them navigate their environment. Because their poop is cube-shaped it is less likely to roll away or be moved. In Wombat Rescue you play as the mama wombat of your tribe. 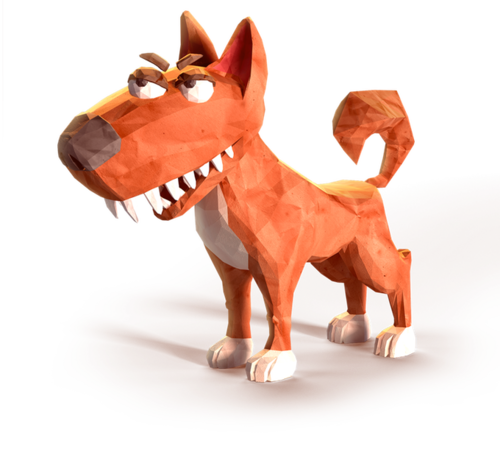 The dastardly dingo has stormed your burrow and chased away 4 of your baby wombats! 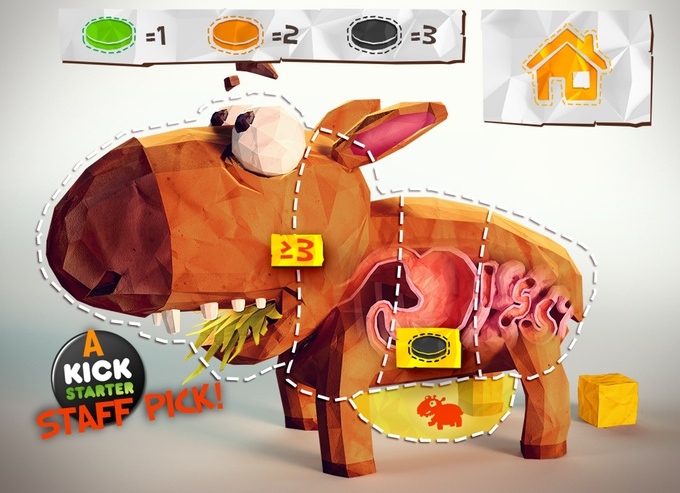 You will need to eat and digest food in order to produce poop cubes, with which you will build smell areas so you can navigate your environment, find your baby wombats, and bring them home. The player who best plans their smell areas and moves most efficiently will prove victorious! Tom: That is so very cool. How did you settle on that theme? Did the game have another theme prior? Matt: All the mechanisms in the game are derived from the theme. I started with theme and figured out how to build a game that integrated the theme. There was never a previous theme and I never seriously considered changing the theme. Tom:What is unique about it besides the theme? Why should I buy it? Matt: I hesitate to claim that anything is unique because I’m just one guy who can’t be omniscient with all the games out there, especially with all the games that are being released these days. I’ve never seen or played a game with network building and spatial movement like Wombat Rescue, but I won’t be the one to definitively claim it’s unique. I certainly hope it is and I hope reviewers and players agree. But it would be disingenuous for me to claim uniqueness when I simply can’t know that for certain. But one reason why I think people should back the game on Kickstarter is because it’s a euro game that actually has deep thematic integration with the mechanisms in the game. I think more and more euros are starting to be released with better thematic integration instead of slapping a theme on top of some mechanisms, and I’m proud that Wombat Rescue is one of the games leading this movement. Tom: How did you get someone to buy a game about wombat poop? Matt: It all started at Unpub 4. That was the first public appearance for the game and Ralph Anderson from Eagle-Gryphon Games played it and loved it. He wanted to see the design after some further improvements. I worked on the design some more after Unpub 4, sent it off to Ralph, and he loved the improvements! He gave me the OK to send a prototype to the CEO for a final decision. I made a huge mistake and didn’t get the rulebook blind playtested before I sent it out and the CEO’s group had trouble playing it. So I decided to buy a ticket for Origins 2014 to play the game with the people from Eagle-Gryphon to ensure it would be played correctly. They played it and loved it and we had a handshake deal right then! Tom: Playtesting, actually getting my game in front of people, is the hardest part of design for me. Because I often feel that I’m wasting their time. What is the most difficult part of designing for you? Matt: You need to get over that feeling. You’re only wasting people’s time if you aren’t valuing their time by ignoring feedback and making changes appropriately. For me, the most difficult part of game design is development. I’m pretty good about getting a design to the point where it’s playable and fun. That part is usually fairly easy for me. But taking a design from playable and fun and sanding, polishing, and trimming the game to its final form is difficult for me. Maybe it’s difficult for all designers? I’m not sure. Tom: I think the refining process is difficult for all of us. What was the hardest thing you had to cut from Wombat Rescue? Matt: Actually, nothing was cut. Things were changed, tweaked, and added. But the core of the game has stayed largely intact since the initial design. It’s very atypical for most designs. Tom: That’s cool. What was THE best piece of feedback you received on the game? 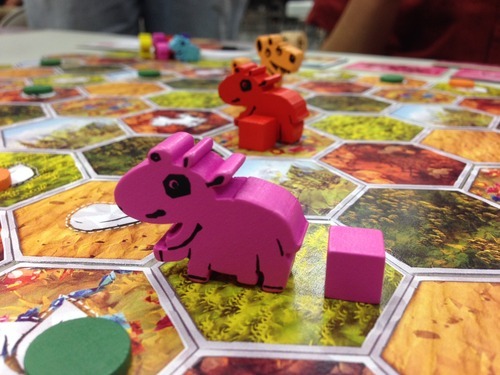 Matt: One of the first playtesters at Unpub 4 told me it was better than any published game he had played that week. I was smart enough not to ask which games he had played since he could have played Munchkin or something like that, but that comment was still a great piece of feedback and really made me feel like I could do this design thing. Tom: Wow, that would make me feel fantastic too. What other games do you have in the queue? Matt: Oh man, I have a ridiculous number that I need to polish up and find homes for. Junkyard Fort, Avalanche on Yeti Mountain, Balloon Delivery Service, Ubar: Atlantis of the Sands, Demolition Derby Dice, and a couple of others that I need to figure out how to fix. I hope to find homes for several of these this year. Tom: I’ve played Avalanche and Balloon and enjoyed them both. Ubar sounds really neat. I hope I can play it soon. We’re brother Geek Allstars. That’s a ton of fun. What’s the best part of it for you? Matt: It’s just fun to talk games a bit off the cuff with everyone and challenge opinions a little bit on the show. Especially when we all know that Dan’s opinion is incredibly wrong. Especially about movies! Tom: Oh, of course. Dan has … interesting movie tastes. I really like talking about movies and comics the most I guess. You’re known as a hipster gamer. How did you get that label? Matt: You know, I think Dan Patriss may have been the person to give me that label. I tend to like quirky themes and games that are a little off the beaten path, and thus games that most people probably haven’t heard of. Or if they have heard of the game they haven’t had a chance to play it yet. So hipster gamer sort of became what I’m known for. I’m OK with that label. Tom: You are the Unpub guy in our area. Thank you very much for that. The events you and your wife have organized have been very successful for the designers in our area. 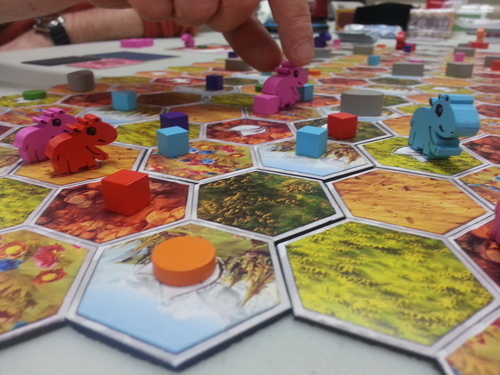 Any secrets to running a smooth, successful Unpub Mini? Matt: Oh, it’s my pleasure. My big secret is my wife, who actually runs the event on the actual day as I sit at my table and run playtests for whatever I’m showing off. My wife is amazing and I couldn’t do it without her. The key to having a smooth event is just organization and preparation. It’s not really any secret. Prepare for the event by running through how things are going to work and finding flaws in your plan. Organize by making sure the designers know what to expect, what they need to do, what the expectations are for them, etc. If you prepare and organize well in the months before the event then the actual day generally will run smoothly. Tom: She did an incredible job. Please thank her again for me. You were very proactive and ahead of the game with keeping us designers on the ball. I had very good playtests of Tourist Traps. Thanks again. You are the organizer and ‘leader’ of the Game Designers of Carolina. How did that happen? Matt: I’m the type of person that when I see a gap I like to fill the gap. When I first started getting interested in designing games I asked around to see if there was a game design group in the area. There didn’t seem to be one and there were a couple people who expressed interest, so I started one! We had about 8 people who attended that first meeting and I think only 3 of those people are still involved, but we’ve grown very strong over the past 2 years and we have a lot of very talented people in the group now (including yourself!). Tom: We tried to get something together in Durham but it never gelled. I’m very glad GDoC is there. I very much appreciate this group though I don’t get to attend meetings as much as I would like. The group has been very valuable to me, especially on Tourist Traps. How valuable is a group like this to designers, in your opinion? Matt: I think a regular design group is the single most valuable thing a designer can have. No designer can consistently be an island. You have to be able to bounce ideas off of other people and get other people to playtest your designs. Creativity happens best when people interact with each other. Creativity is exponentially amplified when you work with other people who are interested and invested in the same thing as you. I encourage every designer to either find or start their own group. It’s the single best choice I’ve made in my design “career” so far. Tom: Drew Hicks, a member of GDoC, said it on Twitter recently – “Like, one of the best things about @GDofNC is being surrounded by people that will be supportive, but totally honest. Much appreciated.” That is so very true. I work SO much better with people to work with. Matt: It really is true and that’s exactly what a group can do for you! Tom: What are some of your current favorite games? Matt: This is a surprisingly difficult question because I have such a large backlog of unplayed games that I tend to play them once and either put them on the shelf or get rid of them if I hated it. But Glory to Rome, Carcassonne, Luna, Eclipse, Belfort, For Sale, Francis Drake, Trajan, and Galaxy Trucker are some of my favorites. Tom: Excellent choices. We have similar tastes in games. Do you have a favorite designer? Matt: Oh yes, Stephan Feld is my favorite. I don’t care if people try to derisively call his games “point salad” or whatever. He designs games with ingenious mechanisms and an unstable underbelly within a euro framework that just speaks to my gamer heart. Tom: I’m a Feld fan boy too. Macao and Trajan are so fantastically brain burny. What are your Origins plans? 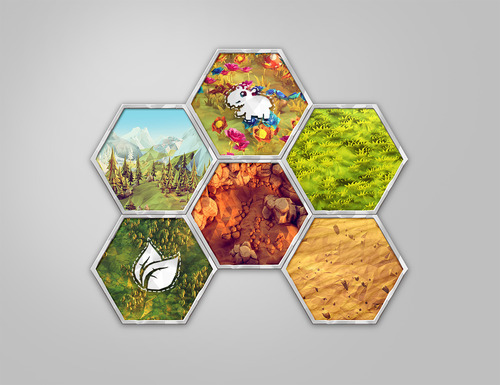 Matt: Since the Wombat Rescue Kickstarter project is running through Origins, I will be demoing it as often as I can. Other than that I plan on seeing friends I haven’t seen in a while and getting far too little sleep! Matt: I’m going to GenCon for the first time this year. There are a couple Wombat Rescue sessions that I’ll probably run and there’s the live Geek AllStars recording on Saturday that I’ll be part of. Other than that I’m going with a completely open schedule so I can experience whatever I want to experience. I didn’t want to burden myself with a bunch of events for my first time and find that I was too booked up to have any fun. Tom: That sounds like a perfect plan. I will remember that when I finally make it to GenCon myself. Matt, I’m really glad to have had you as a guest on Go Forth. It’s been a lot of fun getting to know you better. You have a permanent invitation to come back anytime. Readers, you can find Matt on Twitter (@mattwolfe) & on BGG (mattwolfe). You can support Wombat Rescue right here. It’s one of the hits of Origins 2015 so get on board NOW! Did you enjoy this conversation? Have something to say? Post your comments on Twitter #goforthandgame. Or you can email me – tomgurg@gmail.com. Or leave a comment here by clicking on the word balloon at the top of the page.